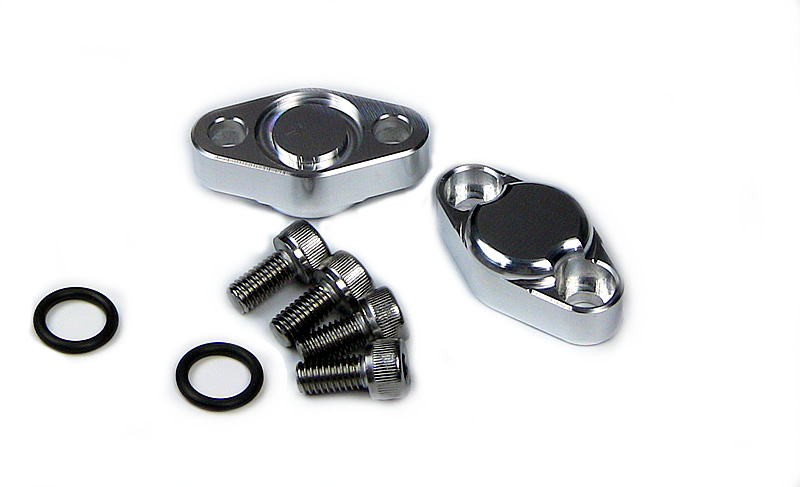 The Spencer Cycle oil cooler block off plates allows you to remove your oil cooler for weight savings or when your exhaust system won't allow you to run an oil cooler or when you are using a low profile billet aluminum oil pan. Our oil cooler block off plates can use the factory O-rings, however each kit is supplied with new orings and stainless steel bolts. No other kit on the market is as complete as this one is. We designed the Spencer Cycle Oil Block Off Plates with functionality and form and great looks in mind. Another great feature is our kit has flush mount /recessed stainless steel mounting bolts for that trick and clean installed look. CNC Machined out of solid billet 6061 Aluminum. Supplied in a pair (2) with stainless steel bolts and o rings as pictured. Use our Oil Cooler By Pass Kit if you don't want to modify your oil restrictor. Click the button below to add the Oil Cooler Block Off Plates-Suzuki GSXR1000 (2001-2008) to your bike build.